I attended the National Holistic Institute of Massage Therapy in 2007 and received a 720 hour certificate as a Massage Therapist. I am state certified by the California Massage Therapy Council (#62125). In addition, I have enjoyed taking the following continuing education courses to further my ability to serve my clients. 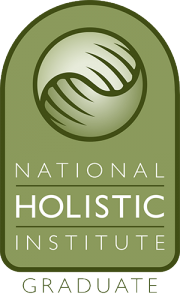 In addition to my training as a Health Coach from the Institute for Integrative Nutrition’s (IIN) cutting-edge Health Coach Training Program, I have also completed a 5-week Digestive Intensive course through Andrea Nakayama’s Holistic Nutrition Lab. At IIN, I studied over 100 dietary theories, practical lifestyle management techniques, and innovative coaching methods with some of the world’s top health and wellness experts. My teachers included Dr. Andrew Weil, Director of the Arizona Center for Integrative Medicine; Dr. Deepak Chopra, leader in the field of mind-body medicine; Dr. David Katz, Director of Yale University’s Prevention Research Center; Dr. Walter Willett, Chair of Nutrition at Harvard University; Geneen Roth, bestselling author and expert on emotional eating; and many other leading researchers and nutrition authorities. At Holistic Nutrition Lab I studied the gastrointestinal system, its common dysfunctions and symptoms, and recommendations that can help to heal the gut. I am particularly drawn to supporting individuals to heal GI issues because most, if not all, health problems stem from digestive problems, even if no GI symptoms are present. You can only be as healthy as your gut!